Synthetic peptide conjugated to KLH derived from within residues 1 - 100 of Chicken H2A.Z. Our Abpromise guarantee covers the use of ab18262 in the following tested applications. WB Use at an assay dependent dilution. Detects a band of approximately 14 kDa (predicted molecular weight: 13 kDa). ChIP - Anti-H2A.Z (acetyl K4 + K7 + K11) antibody (ab18262)Image from Bellucci et al. PLoS One. 2013;8(1):e54102. Figure 3 (d) doi: 10.1371/journal.pone.0054102. Epub 2013 Jan 18. ChIP analysis of Acetyl-H2A.Z at the p21 transcription start site with or without the HDAC inhibitor TSA (50ng/ml). Chromatin was prepared from MDA-MB231 cells. Cells were fixed with formaldehyde for 10min. Samples were sonicated to generate DNA fragments between 500 and 700 bp. The ChIP was performed with 50µg of chromatin, fragments were immunoprecipitated using 2µg of antibody ab18262, and an HA antibody was used as control. The precipitated DNA was amplified by real-time PCR, with primer sets designed to amplify the promoter and the coding region of the p21 gene. 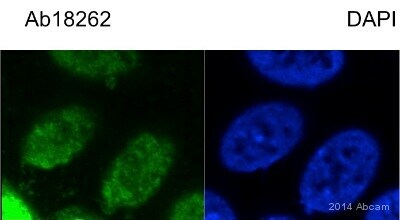 ab18262 staining Histone H2A.Z (acetyl K4 + K7 + K11) in HeLa cells by ICC/IF (Immunocytochemistry/immunofluorescence). Cells were fixed with paraformaldehyde, permeabilized with 0.5% Triton X-100 and blocked with 3% BSA for 1 hour at 22°C. Samples were incubated with primary antibody (1/500 in PBS + 1% BSA) for 1 hour at 22°C. An Alexa Fluor® 488-conjugated donkey anti-sheep IgG polyclonal (1/1000) was used as the secondary antibody. Lanes 2 & 6 : Nucleosomes from 10-day chicken brain tissue. ChIP Input. Lanes 3 & 7 : Nucleosomes from 10-day chicken brain tissue. ChIP Unbound. Lanes 4 & 8 : Nucleosomes from 10-day chicken brain tissue. ChIP Bound. Nucleosomes from 10-day chicken brain tissue were used in ChIP experiments. 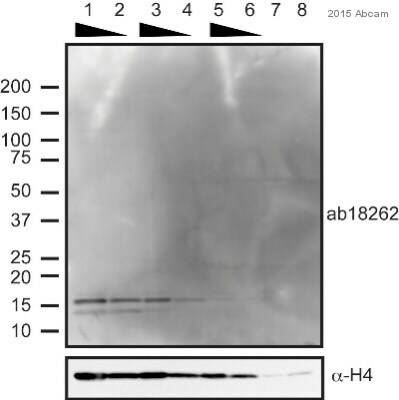 An acetic acid / urea / Triton gel was run and the corresponding western blot using ab18262 was used to compare proteins in the Bound chromatin fraction with those of the Input and Unbound fractions. In lane 8 there is a strong diffuse band corresponding to a hyper-acetylated H2A.Z. Publishing research using ab18262? Please let us know so that we can cite the reference in this datasheet. I have a question regarding the acetyl H2A.Z antibody. I was wondering whether there is any data with regards to if it can cross-react with acetylated H2A? Regarding the specificity of ab18262, referencing Bruce et al, 2005, Nucleic Acids Research v33, p5633-5639, Fig 1. Although SDS gels/Westerns do not distinguish H2A from H2A.Z (Panels A & B), in AUT gels/Westerns they are readily distinguished (Panels C & D). In the HeLa butyrate lanes (HB, where the acetylation of all the histones is high) the Western shows a pair of H2A.Z bands and no H2A band (despite the amount of H2A being much greater than that of H2A.Z). In the Bound fraction from the ChIP, there is a strong signal from H2A.Z but none from H2A. Thus, ab18262 is specific for H2A.Z and does not recognise H2A at all - as expected since the H2A.Z N-terminal peptide immunogen is not represented in H2A. Inquiry: hello, I would like to ask if anybody have used this antibody to do chip on Saccharomyces cerevisiae and if it works fine? thanks very much. With only 41% homology between the immunogen and the yeast histone (see the attached pdf), it is unlikely that ab18262 would work on yeast. I would like to recommend checking the Biocompare website which has an excellent antibody search facility that includes many suppliers. The link is http://www.biocompare.com. Thanks for your reply. I tried to start with the abreview but was told that ab97966 is not a valid ID (link below)… any idea? And another question: Will the abreview be made available to the scientific community even though the product has been discontinued? I'm sorry about that. It might be that the system won't let you submit a review for an unpiblished antibody. I was not aware of this. If you wouldn't mind, could you just share the information with me by filling in the relevant form attached to this email? This should only take 5 minutes. Could you also let me know how you would rate the antibody out of 5. This information would only become accessible to others if we republish this antibody in the future. Once the form has been returned to me, please go ahead and use the discount code I provided for you. Along with the discount code could you please quote "antibody unpublished, testing discount agreed with Karin". This means customer services know to speak to me once the order goes through so the discount will be added. Thanks I will proceed with the order! Please do not hesitate let us know if you have ever any questions or there are other ways that Abcam may help you meet your research goals.
. I was just about to buy this kit for histones extraction but I was wondering if with this kit the different modifications of the histones are intact. I am specially interested In check after the extraction, by WB, acetylation of H2A.Z (ab18262). Could you advice me please? This product has been designed to extract histones with their modifications intact. Therefore this should be very suitable for your needs. I have some questions about some of your products. Thank you for contacting Abcam and for your interest in our products. Regarding theH2A.Z (acetyl K4 + K7 + K11) antibody ab18262, the number of bands can be indeed due to different acetylation states as we have found multiple bands in our own WB and attribute more bands to hyperacetylated Histone H2A.Z. Hi,Can you please check ? I have asked for 2 vials of abcam Anti-Histone H2A.Z(acetyl K4 + K7 + K11)antibody -ChIP Grade Cat No.ab18262. The shipment I have received contains 2 Anti-Histone H2A.Z antibody with the same Cat No.ab18262, but on both the vials description is written as H2A.Z(acetyl K4)antibody. is it the same antibody i have ordered or a different one? please clarify the difference ASAP. I can confirm that ab18262 regognizes Anti-Histone H2A.Z (acetyl K4 + K7 + K11) antibody - ChIP Grade. It may well be that the label of the vial has the shortened form of this target name due to limited space ie. formatting. Could you please confirm if the label has the Abcam new logo and the batch number printed?